Maya Angelou, the warrior writer, actress, singer, civil rights activist and best-selling author, would have celebrated her 89th birthday on April 4. In her later years, Angelou, who died in 2014 at the age of 86, was frail but unbowed, her voice a lower-register sonic boom spilling forth knowledge and wisdom. Pop culture has a way of reducing great artists down to tidy, relatable personas, especially once they have died. But it would be a crime to think of the unstoppable Angelou only as Oprah Winfrey’s surrogate mother or President Bill Clinton’s favorite poet. She was — and is — so much more. Consider her fashion choices. The prolific author was a stand-in for fly black women everywhere. Young Maya had everything at her disposal: the attitude of a fighter, the grace of a dancer, the bearing of a star in the making. She was always sleek and sassy, and dressed as many international creatives do; everything was game as long as it felt authentic. Filmmakers Bob Hercules and Rita Coburn Whack’s acclaimed documentary Maya Angelou: And Still I Rise, which is streaming on PBS.org, used archival film footage and her family’s collection of photos to place Angelou in a historical context and show how her fashion choices helped to explain her world, her talent and her legacy. 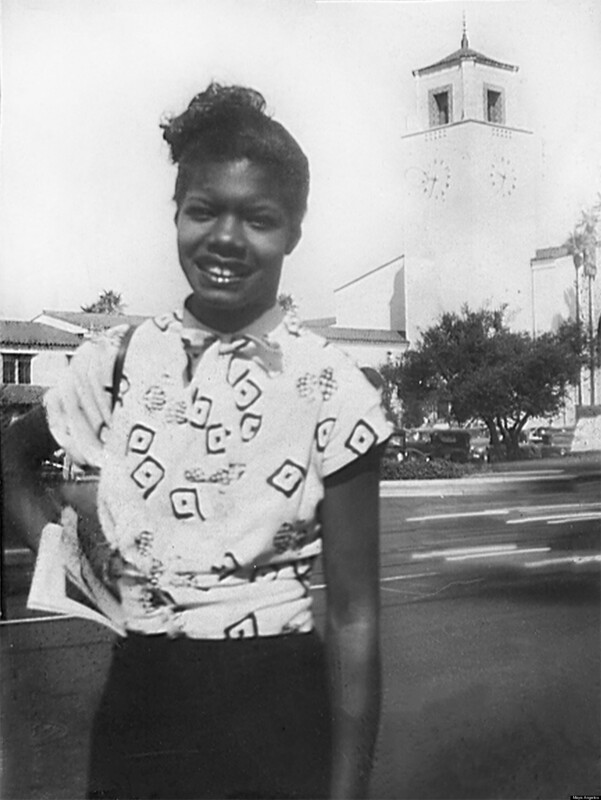 It’s really delightful to see all of Dr. Angelou in all of her finery throughout her life. What a treasure trove of images you had. Rita Coburn Whack: Colin Johnson [Angelou’s grandson] opened up his family’s photo album after Dr. Angelou passed. I remember going to her Washington, D.C., home, and finding 12 banker’s boxes filled with hundreds of photographs. The first thing I did was to go to the ’50s, ’60s and ’70s, because that’s where we had the most deficit of photographs. Colin Johnson: We have 8,000 to 10,000 photos of her. From a family historical legacy and perspective, there’s a lot of work to be done there — not necessarily for financial gain, but for family accuracy and our records. But we have thousands of photos that go back to my great-grandmother when she was young. Did Dr. Angelou keep any of her clothing in storage? I’m thinking of the gowns from her years as a dancer or costumes she wore in films. Colin Johnson: It’s interesting that you ask that. After grandma passed, all of that stuff ended up coming to me. We have a storage location in L.A. that has every outfit that she wore to all of the larger events, from Bill Clinton’s inauguration and so on. But she didn’t keep the costumes from her younger years — except for the head wraps and hats. She even kept some of the same head wraps that I saw her wear as a kid. So she wasn’t sentimental about clothing? Colin Johnson: She saw the value and respected the experience that she had with something, but she wasn’t a hoarder (Laughs)! Take the dining room table — she appreciated the stories told around that table and she had a reverence for the people who sat there with her. 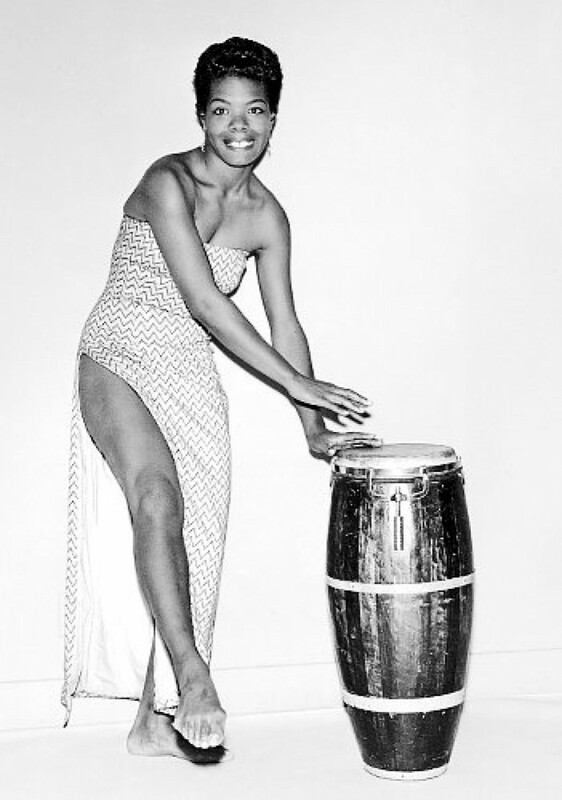 Dr. Angelou seemed like a textbook case of black women and 20th-century fashion. You can see the time periods through her hairstyles and clothing. Rita Coburn Whack: Because her life was so well-documented, it was easy to place her in context simply through photos and what she was wearing. The way she wore her hair in Cairo when she wore Chanel-like looking suits was not the way she would have worn it when she lived in Ghana. When she moved to Ghana, she wore the Ghanaian dress and her hair was natural. Then she brought that back to the States and wore it here. And what she wore during her years as an actress, a teacher, a world-famous writer really placed her in an interesting global context. 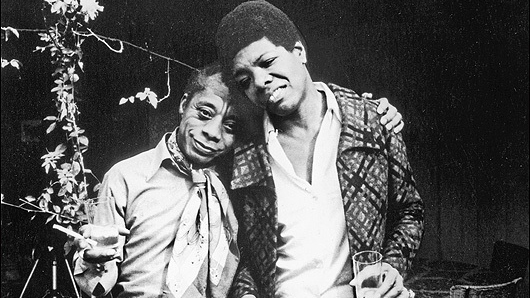 James Baldwin and Maya Angelou, posing for a snapshot at a party in the late 1960s in Beverly Hills, Calif., met and bonded in Paris in the 1950s. She says he became like family to her. 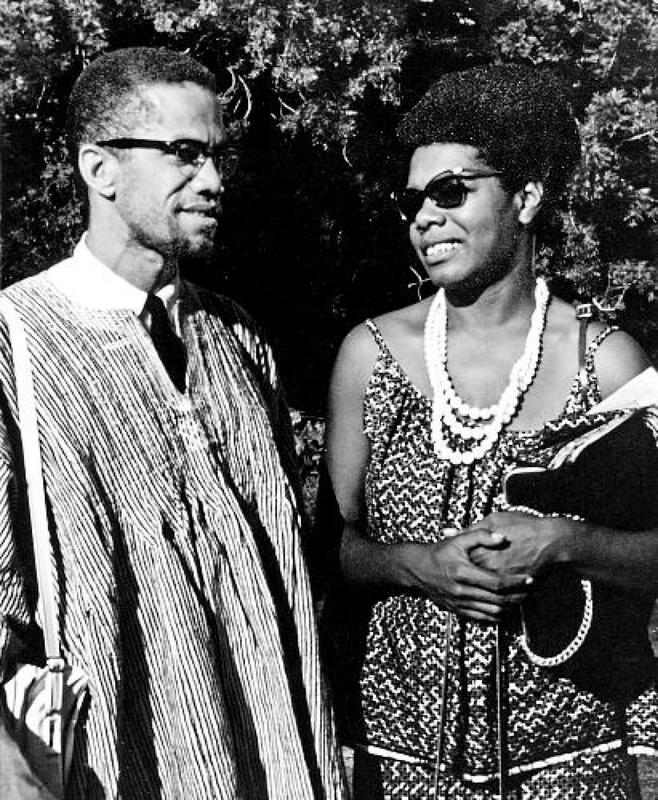 During her travels abroad, Angelou befriended Malcolm X when he visited Ghana in May 1964. The two wrote to each other frequently upon his return to the United States. 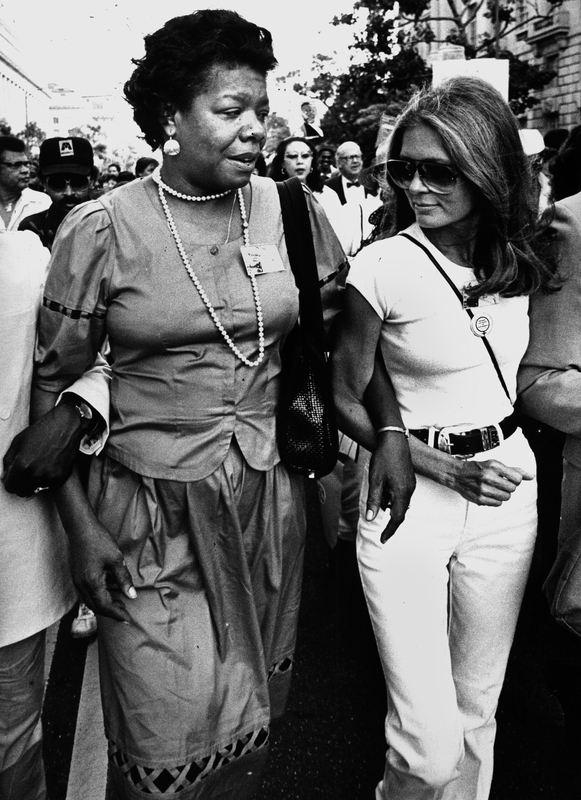 Maya Angelou and Gloria Steinem on their way to the March on Washington on August 27, 1983 in Washington, DC. 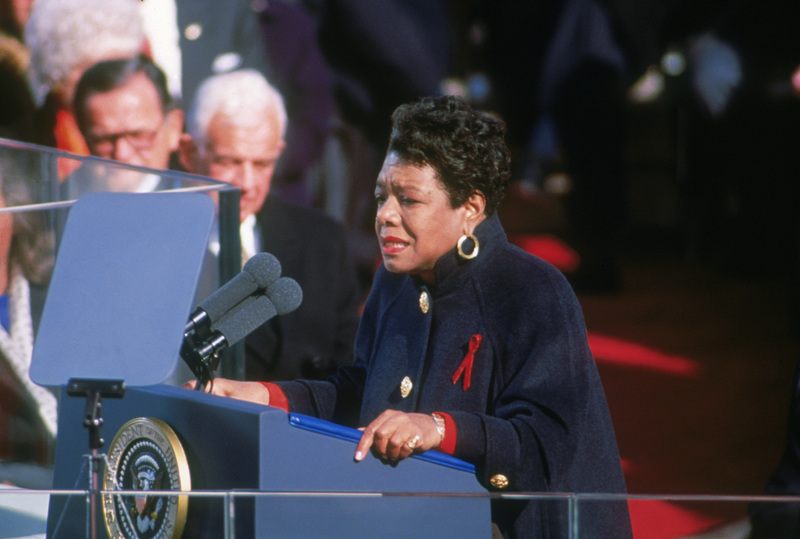 American poet Maya Angelou reciting her poem 'On the Pulse of Morning' at the inauguration of President Bill Clinton in Washington DC, 20th January 1993.